Time was when fresh green peas were only available in winter and at exorbitant prices in South India. Frozen green peas were a thing out of science fiction. In these antediluvian times, even a few kilos of fresh green peas created a lot of excitement in a family, where our foremothers were pioneers of the zero-waste, sustainable, waste-not-want-not approach to everything that required the expenditure of any resource. This said approach was invariably applied to the said peas, which were divided into categories based on their quality. 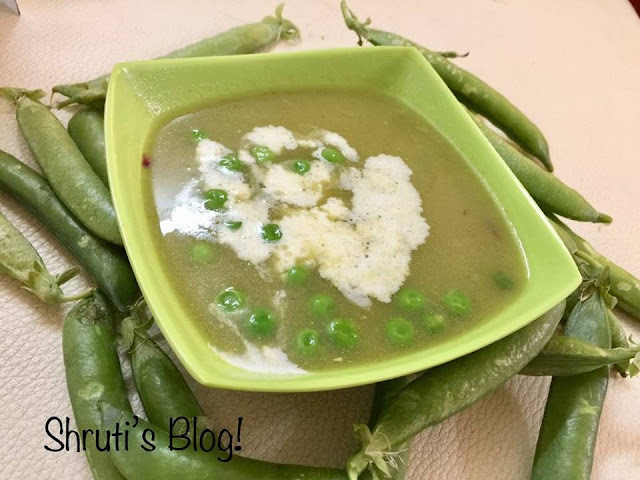 The random prematurely plucked pea pods were destined to go into Aai’s famous pea shell soup, which was another winter must-have. Tender pea pods were reserved for the privilege of “matar gashti” – literally guarding a field of green peas, and figuratively having fun. There are fewer pleasures in life greater than shelling tender peas and eating them. We were allowed all the tender ones, but with a proviso. We kids had to string and break the shells into pieces for the pea shell soup. Our interest rarely lasted beyond hastily stringing the pods after the peas had been popped, knowing that Aai would patiently pick the remaining shells that qualified for the soup. The bigger peas ones were used for cooking – whether it was in a curry, a pulao or a masale bhaat and their shells didn’t always land in the soup, if they were tough and fibrous. Aai’s pea shell soup was as mysterious as the witches’ charmed soup in Macbeth. Make for the gruel in our cauldron…"
At this point, the magical soup reclaimed our attention. Hope it captures yours. Wash pea shells and scrub potato – if the skin is clean, don’t peel. Place the shells, half a cup of peas, the chopped potato and onion, coriander, green chilli and the garlic cloves in the body of a pressure cooker/ pressure pan. Cover with about 2 cups of water. Pressure-cook the vegetables for about 10 minutes. When cooled, blend using a stick blender or a mixer. Strain with a large holed strainer, ensuring that no cellulose bits get into the soup extract. In the same pressure pan, heat oil and add the cloves and cinnamon stick. Add the finely chopped onions, the minced garlic, fresh ginger and remaining shelled peas and sauté for a few minutes. Pour the soup mix into the saucepan and let it simmer. Add salt and pepper to taste. Squeeze half a lemon when the soup has boiled. Serve hot with a dash of fresh cream or use coconut cream if you want to keep this soup vegan. Lovely! Am so going to make this!